All the goodness of Flaxseed oil with the reminiscent childhood taste of Red Hot candies. Kids of all ages love it over oatmeal with fresh cut apples. Try it over sweet potatoes and yams.� Organic lemon oil is added to our fresh filtered flax oil for a delicious oil bursting with fresh lemony flavor. Makes a great oil for salad dressing. Bursting with delicious Strawberry Banana flavor, these chewable softgels will give your kids healthy doses of Omega-3 ALA and DHA and Vitamin D3. DHA supports a child's brain and vision development. * Studies have shown many children may be getting low dietary levels of Vitamin D. One serving of this unique non-fish DHA formula provides 125mg of DHA and 1000IU of Vitamin D3, while avoiding the risk of ocean-borne contaminants sometimes found in fish oils. Flaxseed is the most concentrated source of of SDG lignans - phyonutrients that exhibit strong antioxidant properties and can have a balancing effect on hormones. * Our Enriched Organic Flax Oil with Lignans has the same fresh, clean taste as our flax oil, with the added benefit of freshly sliced flaxseed added in. 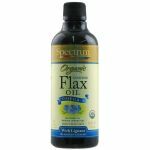 A sweet, nutty taste!� Flax Oil is nature's richest source of alpha-linolenic acid (ALA), an omega-3 essential fatty acid your body naturally converts to EPA and DHA - the same fatty acids in fish oil that support heart health, reduce inflammation and improve cellular integrity. Our organic flax oil is always fresh and never bitter due to our proprietary 3-step organic filtration process that removes impurities. The result is a clean, fresh-tasting golden oil. Our ultra enriched flaxseed has a wonderful flavor, unlike any you've ever tasted. We organically filter our oil to remove impurities that cause bitterness and rancidity, then use a proprietary milling and blending process to add freshly sliced flaxseed for a sweet, nutty taste. You'll love it! Flaxseed is the most concentrated source of of SDG lignans - phyonutrients that exhibit strong antioxidant properties and can have a balancing effect on hormones. Borage Oil contains Omega-6 Essential Fatty Acids (EFAs) including a high concentration of Gamma-Linolenic Acid (GLA), which is vitally important to health. Many people are deficient of this important EFA.